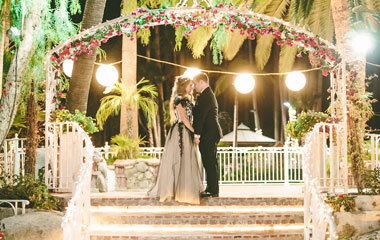 From a traditional archway, to cascading brick stairs to a lush palm tropical grass setting, couples can choose from a variety of locations to exchange vows. 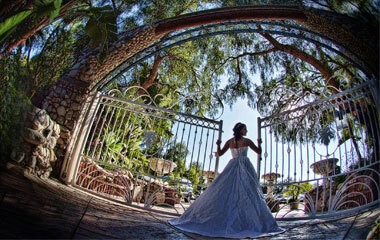 Fountain, waterfall and bridge locations accommodate memorable photo opportunities as well. 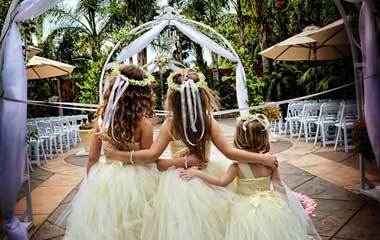 One of the most popular settings, nestled in storybook bougainvillea covered arches, with lush tropical floral. The perfect setting in front of the lagoon, on a flight of brick stairs, with an overhead arch to exchange vows. 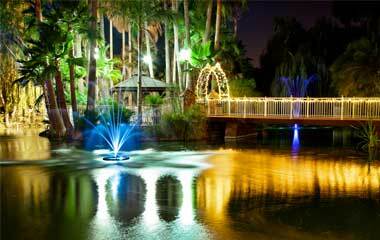 Exchange vows surrounded by beautiful roses and palms with a back drop of the cascading double tier waterfall. 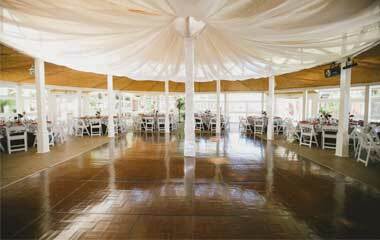 Celebrate your wedding any time of year at Rancho de las Palmas, one of Los Angeles and Ventura County’s premier outdoor venues. The private estate features hundreds of palm trees, lush foliage and a spring-fed lagoon with a picturesque bridge, offering an unforgettable reception at twilight. Guests are welcomed through classic French doors into the large pavilion, where we turn your reception dreams into reality. 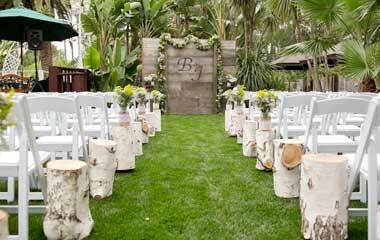 The open air environment encourages mingling, while enjoying the beautiful tropical scenery.